Sometimes it takes more plays to capture a stone or chain of stones than its number of adjacent empty points. Since the dame liberties are here called also primary liberties, it is perfectly natural to look at a secondary liberty concept that tells you the difference. See the liberty page for the start of this distinction. Another term, that has more general currency, is approach move. In some cases, certainly some of the less complex cases of capturing races, the phenomenon of secondary liberties is adequately explained by saying that approach moves are required, to remove a shortage of liberties. This is taken from secondary liberties example A. We reduce the discussion there to its essentials, by not mentioning further the primary liberties. need to play twice to fill the liberty at the circle-marked point. So, once we try to put all the liberties on one 'map', there is a distinction. The second point of view is available as an interpretation of secondary liberty, as a different map. Talk about "moves to capture" - which would be better called capturing metric in my personal opinion - causes trouble. It causes trouble because there is a fairly well-defined notion of 'the number of liberties a given group has in a given capturing race with a given player to play', under some assumptions such as which chains will be sacrificed and how any kos work out. The difference of the numbers of liberties of two groups locked in a capturing race will tell you who is ahead in the race; and even how many times tenuki is safe. So in the secondary sense the term liberty is only used in the phrase number of liberties of a group conditional on (stuff). 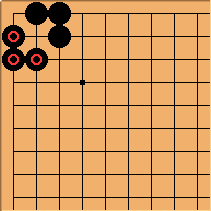 You cannot necessarily show the liberties as a set of intersections on the board. You may be able in some good cases to show some points that ought to be counted more than once. 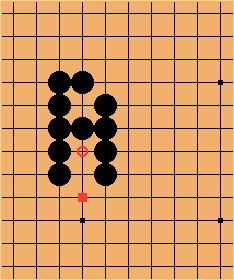 Or you may be able to account for the sense by pointing to approach moves; which for example in big eye cases will involve plays under the stones. Keeping the chain/group distinction is important here. If the 'capturing metric' sense of liberty is intended, you cannot calculate the liberties of a chain on a stand-alone basis. The group page rightly starts with the comment that this is an informal notion. Of course it isn't that one doesn't use the 'capture metric' sense, intuitively. Here the stones have five liberties; but as they can't be captured that has become quite irrelevant, for the rest of the game. I guess that being able to 'map' secondary liberties is just about the same as strength in capturing races. See also attrition method approach move map for another attempt, for a big eye position. In that case one has to cope somehow with many different ways to play the approach moves inside the eye.